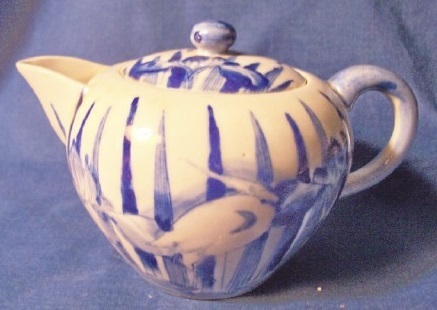 Small teapot has these characters on the bottom. I wanted to know what they say. Thank you. On the right: Dai 大 Nippon 日本 (Great Japan) Hizen 肥前. On the left: Arita 有田 and then 2 marks of the artist's name which I can't decipher followed by Sei 製 (made). Arita is a town in the Hizen province, this is Arita porcelain from the late Meiji period (circa 1900). Perhaps I find more time in the weekend to figure out the name. Thank you for this, anyway. Have found the name, which is Aoki 青木. So the complete mark is: Dai Nippon - Hizen - Arita - Aoki Sei. See also the my picture. 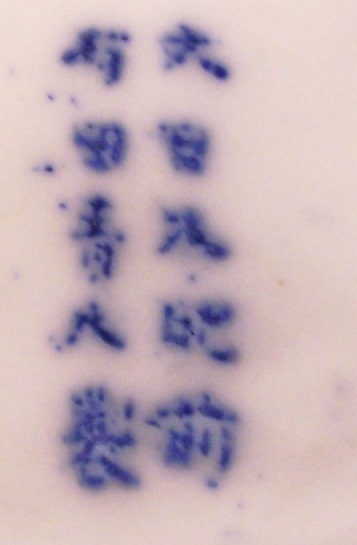 Mark of the Aoki Kyodai-Shokai (Aoki Brothers Company), which was founded in the 1890's by Aoki Jinichiro (1863-1955). The Aoki Family Kiln was a very important Japanese Hizen kiln: the Aoki Ryuzan Kobou Gama (kiln). The Aoki Kiln closed after the turn of the century (1900) before they were reopened later by 2 descendants. Thank you so much, Martin. I appreciate your effort.